The Commonage is the fastest selling neighbourhood at Predator Ridge, adding over 27 acres of dedicated park space and featuring a wide variety of detached, semi-detached and premium lots with panoramic golf course, lake and valley views. Part of this dedicated park space includes their new Commons Park, a 3.5 acres park, which is now the social heart of the Commonage neighbourhood and a place of gathering. 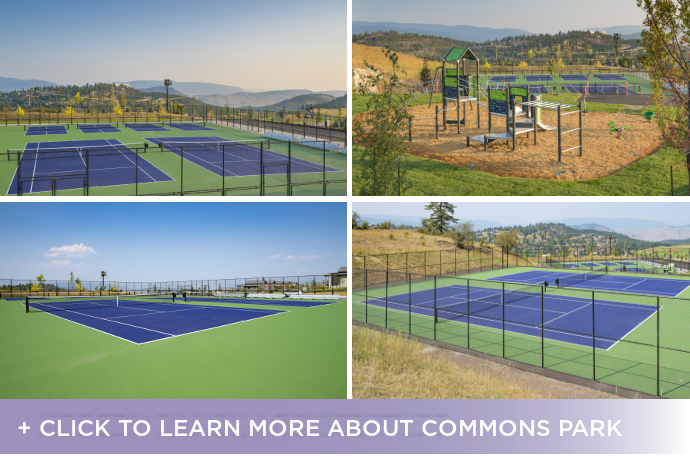 Boasting sweeping views across the emerald fairways and mountain vistas, Commons Park features active facilities including four tennis courts, four pickleball courts and a new childrens playground. The new racquet courts are open daily between 7am – 10pm and exclusively available for Predator Ridge residents and resort guests. They have tennis racquets and pickleball paddles available for rent in the Fitness Centre. Along with the new courts, they’ve introduced a new tennis program for residents and guests featuring world acclaimed tennis coach Milos Pospisil, who has coached numerous top Canadian and European juniors, including his son Vasek, a Wimbledon Doubles champion. Commons park now adds to the other amenities this new neighbourhood is adding to the Predator Ridge community including a third outdoor yoga platform and lavender meadow. Discover a better life at Predator Ridge. What they offer is world class and unlike anywhere else in the Okanagan. Predator Ridge is the most amenity rich community in the Okanagan and comes with peace of mind knowing you’re buying into an established, amenity-rich community built by some of the most trusted names in development.